Welcome to the third entry in my fountain pen guide. In this session, I’ll be guiding you through how to take a pen that’s writing poorly and fix it up, making it write like new! Don’t worry if you’re an absolute beginner, I’ll explain everything as clearly as possible, with step by step guides to help you along. Remember that as with all these guides, any unusual word will be highlighted in red and defined at the bottom of this page! Do note that this is not the be all and end all of maintenance guides, and I can’t cover every possible scenario. Also note that this is not a restoration guide. That may be for a different day. You can use some of these techniques to get older, dried-up pens up and running, however. DISCLAIMER: I will not hold any responsibility for pens possibly broken or ruined by you or anyone else after following these instructions. These instructions are very general, and your pen may have more wrong with it than you thought initially. Again I recommend you keep calm when attempting these steps, as any excessive force exerted on your pen can possibly ruin it! If you are afraid of breaking your pen, please send it to a knowledgeable service person that is able to fix your pen for you! Please make sure you diagnose your problem properly before attempting to do some permanent changes. A jewellers loupe, check eBay or a hobby shop for one. Anything 10x magnification or greater is fine. Microfibre cloth. Tissues often leave dust behind that can affect how your pen write, so they’re not ideal. A glasses cleaning cloth will suit. Fixing fountain pens often involves tinkering with small parts, and that’s why you have the loupe! To make sure you can see everything clearly, set everything up in a well lit area. Because little bits of dust and other contaminants can wreak havoc on fountain pens, also make sure this area is clean! And keep any electronic devices away before you spill water on them. Also make sure you’re calm and collected. Working on finicky little nibs can cause you to get frustrated, and that frustration is often taken out on the pen! If you find yourself working up a sweat and getting agitated, stop and come back later when you’ve calmed down. Alright! With that out of the way, let’s work together on getting that pen writing like it should. Pens tend to not write correctly because they are typically made in a process where they are not thoroughly checked (something that is basically impossible for large pen brands). Many manufacturing videos I have seen show workers dipping the pen and writing a few practice strokes and deeming the pen as “OK” if ink comes out and onto the paper. Expensive pen brands, especially pens sold by nibmeisters or custom pens, are usually put under more stringent requirements and will usually get to you in perfect working order. Problems with pens can be categorised as problems with flow, smoothness, and others like the pen not filling very well. Flow is the term for the amount of ink coming out of the pen, and how consistent that is. A perfect pen will write any time the nib touches the paper, and won’t create puddles of ink nor dry up if you write too quickly. Often flow is part of a user’s preference; some people like to write quickly and will need to increase the flow, whilst slow writers may find their pen a bit too wet. Skipping is a term given to breaks in the flow of ink that are unexplained, like when you write a line on a page and the pen stops and starts writing halfway through. Inconsistent flow happens when your pen writes wet sometimes, but dry other times. My pen writes, but it’s so wet and sometimes makes puddles of ink on the page! Sometimes my pen writes well, but other times it’s too wet or too dry! I often have to tilt the nib of my pen to get it to write, otherwise it doesn’t write at all! A smooth nib is something we all want; a nib that is enjoyable to use. Don’t kid yourself into thinking that nib material has anything to do with how smooth it will be, as many steel nibs often have the same tipping material as gold nibs. It all has to do with alignment, how flawed the tipping surface is, and, to a lesser extent, what ink and paper you’re using. Also note that scratchiness is not the same as tooth. Scratchiness is when your nib is out of alignment or has sharp points that scrape on the paper as you write, whilst tooth (aka a “toothy” nib) is the roughness you feel when writing with a nib that’s aligned properly, but has small flaws in the surface that cause “feedback”. My nib keeps catching on the paper and is awful to write with! I’ll address the bold items in this post, because things like cracks and breaks shouldn’t be fixed by you; you should send your pen back to get repaired! Low quality seals are often traits of cheaper pens, so they usually cannot be fixed. Now with all of these possible problems, you may think that fixing a fountain pen is a long process involving a lot of testing. Let me tell you that it is a very very rare occasion to find a good pen that has a problem you can’t fix on your own, either by hand or with help from some tools. If your pen is a cartridge filler, just wait a bit. The ink takes a few minutes to travel into the nib from a fresh cartridge. Make sure you have filled it as per the instructions included with your pen, or consult a guide online (such as my previous post on filling systems). If using a cartridge, make sure it’s pushed in properly. Try removing it a pushing it back in! You’ll often hear a click or pop sound if it’s in correctly. If it still isn’t working, read on for some more hands-on maintenance tips. This may be caused by a blockage in the feed or nib that’s preventing ink from reaching the tip. Read the section on cleaning your pen to fix this. It may also be caused by your nib being too narrow, which acts like a kink in a hose, only letting a tiny amount of ink through. Read the section on opening the flow to fix this. Another cause is the “baby’s bottom” and may require some nib grinding. Skip to that section to fix that. Problem 3: My pen writes, but it’s so wet and sometimes makes puddles of ink on the page! This kind of problem sometimes arises because of improper seating of the nib on the feed, so the seal is not so good and ink is leaking out of places it shouldn’t. Read the section on re-seating your nib to fix this. It can also be caused by the opposite of the Problem 2: the nib’s tines are too wide apart, letting too much ink through. Read the section on opening the flow to fix this. Problem 4: Sometimes my pen writes well, but other times it’s too wet or too dry! This problem is hard to diagnose, because it could be caused by a mix of the previous problems. You should first try to clean out the pen completely using the steps in the cleaning section. If that doesn’t fix it, try switching your ink. If that still doesn’t fix it, try opening/closing the flow a little (sometimes a little too much/too little flow can throw a pen out of whack). If that STILL doesn’t work, maybe you have a nib alignment/shape problem. Grind it! Problem 5: I often have to tilt the nib of my pen to get it to write, otherwise it doesn’t write at all! This is because either one tine is further out than the other, or one is larger than the other. The nib could also have a nasty angle cut to it. If one tine is larger than the other, you’ll need to grind that part down to even it out, in the nib grinding section! If it has an angle to it, then you’ll also need to grind it out in the nib grinding section. If your nib is an “oblique” type, this is intentional, and you shouldn’t attempt to fix this. Problem 1: My nib keeps catching on the paper and is awful to write with! This is often caused by misalignment, as the inner edges of the tip scrape on the paper as you write. Read the section on fixing nib alignment to help with this. It may also be because of sharp points that haven’t been smoothed out of the nib surface. Check out the section on nib smoothing to fix that! This is a common problem for beginners. First-timers often use a ballpoint grip with fountain pens and press down hard. This action can misalign the nib over time and cause it to become scratchy. Read the section on nib alignment to fix this, and also read this post for tips on how to improve your grip and overall writing experience to prevent it from happening again. This can be caused by slight misalignment. First check that your nib is perfectly aligned by checking out the alignment section. It can also be because the surface of the tip isn’t very smooth. You’ll need to smooth it out! Check out the nib smoothing section for more. Try upgrading your paper to higher quality brands like Rhodia and Clairefontaine. If you’re writing on a rough pad, no amount of nib smoothing will fix it! Try changing your ink. Lubricated inks tend to provide a nice smooth layer between your nib and the paper, giving you a nice upgrade in the feel of your nib as it writes. Try cleaning your pen out. Small pieces of gunk in your nib can get between it and the paper, making it feel worse. If you have a very fine nib, sorry but you’re pretty much out of luck. The finer your nib is, the “toothier” it will feel! Maybe consider a wider nib size or get some expensive retipping done on your pen. Try smoothing the nib out in the smoothing section. Inconsistent smoothness is quite annoying, but can be fixed with some patience. Again, slight misalignment can cause this. Check out the alignment section for more! You’ve probably taken your pen apart and somehow gotten the parts from another pen mixed around, and then put the wrong parts in your pen. It’s ok! Just don’t force any parts to fit. This will never work, and the parts made for your pen should easily fit together, so that’s a good indication something is off. You may also have put the parts in wrong. Take a look at a picture of your pen model on the internet and make sure everything looks the same on yours. Make some adjustments if you need to! Problem 2: My pen still won’t write well after I followed these steps! Something you may want to check for is air pockets in the converter/ink reservoir that have formed between the ink and the end of the feed. This can be easily fixed in most cases by throwing in a tiny plastic bearing or stainless steel ball inside the converter to break up the tension and pop that bubble, like the one below! You DO NOT want this little bearing to rust inside your pen, so use only rust-proof materials (like plastic), or pull a ball out of a used cartridge (some pen brands include small bearings inside their cartridges, such as Pilot and Platinum). Wet pens: Pens with too high a flow will often produce more ink when writing, which can often be an undesirable trait. Nib Material vs Tipping Material: The nib material is what makes up the body of the nib, like gold or steel, whereas the tipping material is a different, more resilient metal applied to the very end of the nib, where the nib touches the paper. Alignment: As a fountain pen nib is a fragile piece of pliable metal with two “tines” or “forks”, these tines can bend under abuse and cause an unwanted writing experience. 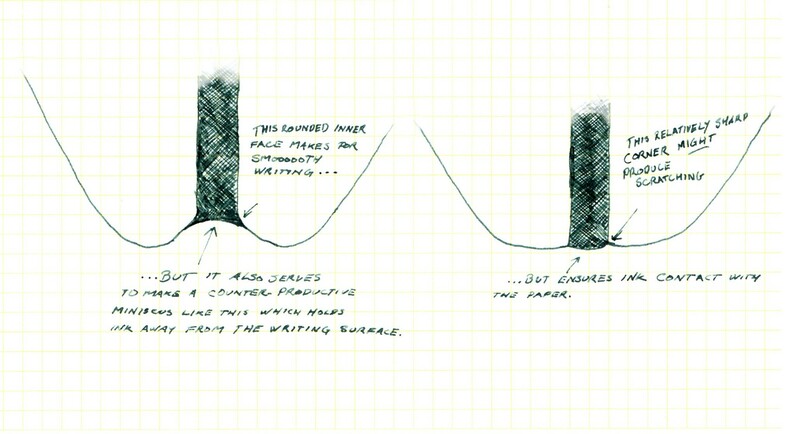 Tipping surface: The shape of the blob of metal at the end of the nib determines many factors, such as smoothness and overall performance and ink delivery. Flaws in this surface can affect any or all of these factors. Ink choice: Inks are not created equally. Some have different chemicals inside to produce different results. In some cases, changing your ink can alleviate many of the problems some, more fussy, pens have. Feedback: Also known as “tooth”, feedback happens when there is a bit of friction between the nib and paper. This causes the pen to feel less smooth, and more like a pencil. Sometimes people like this, and it should not be confused with scratchiness. Seals: O-rings, gaskets, and so on. These keep your pen watertight and failures can result in you getting ink all over your hands. Poor seals are one reason to choose name-brand pens over dollar-store bargain pens. Nib seating: The “seating” refers to how the nib is fitted and positioned on the feed. Poor seating can cause a lot of problems, and usually this can be fixed by removing and reinserting the nib and/or feed. Baby’s bottom: So called due to the characteristic shape of the nib’s tip, this problem prevents the ink from moving from the tip of the pen and onto the paper. See here for a diagram. Retipping: A very expensive procedure whereby more metal is added to the end of the nib to restore its shape or to widen the writing tip. Few people know how to do this well. This entry was posted in Guides and tagged changing ink, cleaning pens, filler system maintenance, flossing nib, fountain pen guide, fountain pen maintenance, fountain pen nib, how to, maintaining pens, maintaining your pens, microfiber, microfibre, micromesh, nib, nib grinding, nib smoothing, session 3 by jono. Bookmark the permalink. Another great contribution to our passion. Thanks Jono!!!!! Thank you so much. I think you saved my nib. Also, great articles! Enter your email address here and Pentorium will update you via email every time a new post is made!